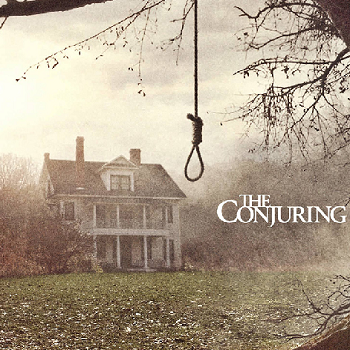 The Conjuring's Actual House Owners Are Suing Warner Bros. The owners of the house featured in The Conjuring are experiencing a little more than supernatural disturbances and are now seeking "unspecified monetary damages." It kind of comes with the territory that allowing a major Hollywood production to shoot a movie on your property might lead to a bit of, how you say, increased tourist activity. In the case of James Wan's The Conjuring, that principle can be applied tenfold. It was a haunted house flick, for starters, and one that both played well with critics and managed to earn an astounding $318 million worldwide on just a $20 million budget. The home depicted in the film also happens to based on an allegedly true story, which was passed down from the home's previous owner to the husband and wife ghost-hunting team, Ed and Lorraine Warren. Cue a couple thousand amateur ghost hunters and lovers of the paranormal suddenly wanting to make a trip to Harrisville, Rhode Island. Unfortunately for the *current* owners of this allegedly haunted house, Norma Sutcliffe and Gerry Helfrich, The Conjuring's popularity has led to some unforeseen intrusions which have pushed them to the brink. Even worse is the fact that their property was not even used in the filming of The Conjuring, but simply hinted at in the film's closing credits. (Sutcliffe and Helfrich) have filed a lawsuit against Warner Bros., claiming they have been under siege by curiosity-seekers, horror fans, and others who want to get a glimpse of the allegedly haunted house in The Conjuring. If you're wondering how anyone knows where the house is, there's an on-screen message at the beginning of The Conjuring that says the movie is based on a "true story" that occurred in a home in Harrisville, R.I. Spend a few minutes with Google and you can find the address. According to the lawsuit, Sutcliffe and Helfrich had no idea that the film being shot in their home was based on a true story until it was released, and have had to deal with a near constant flood of curious tourists ever since. "We've been harassed, trespassed, stalked, and besieged," Sutcliffe told the Globe. "They come at all times of the day. Last Saturday, I called police at 3:30 a.m. because there was a whole group of them outside the house. It's horrendous." Apparently, the "No Trespassing" signs Sutcliffe and Helfrich put up have done little to deter these film fanatics, which is why they are suing Warner Bros. for "unspecified monetary damages as well as a security system and security plan." A security system, eh? I guess "using all that Warner Bros. cash to move out of your demon-infested cabin" just isn't an option, then?